The 35th Infantry Regiment Association salutes our fallen brother, PV2 Teddy Ray Chandler, RA13331538, who died in the service of his country on November 27th, 1950 in North Korea. The cause of death was listed as MIA to Declared Dead. At the time of his death Teddy was 18 years of age. He was from Kanawha County, West Virginia. Teddy's Military Occupation Specialty was 4745-Light Weapons Infantryman. The decorations earned by PV2 Teddy Ray Chandler include: the Combat Infantryman Badge, the Purple Heart, the National Defense Service Medal, the Korean Service Medal, the United Nations Korea Service Medal, and the Republic of Korea War Service Medal. 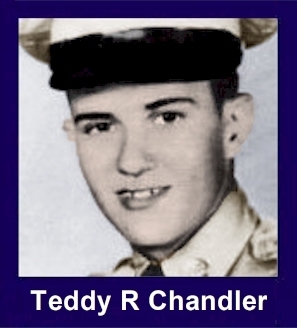 Teddy Chandler was born July 27, 1932, in Charleston, West Virginia, the son of Opha and Rose Mary [Swiney] Chandler. As a young boy he lived with his parents and six brothers and sisters on Piedmont Road on the East End of Charleston. Teddy attended Roosevelt Junior High School and later went on to Charleston High School. On July 28, 1950, the day after his 18th birthday, Teddy enlisted in the Army. He was assigned to Company F, 35th Infantry Regiment, 25th Infantry Division as a light weapons infantryman. In late August 1950, Teddy was sent overseas to Korea with his company and attached to the other companies of the 35th Infantry Regiment, which was positioned with the United States IX Corps near Pusan, South Korea. The part of the line held by the 35th Infantry Regiment covered the main Masan-Chinju highway, the railroad, and the Nam River area, and was one of the most critical sectors of the 25th Division front. Just before midnight on August 31, 1950, a heavy artillery barrage was delivered by the North Korean 6th and 7th Divisions along the 25th Infantry Division front, and a major assault was launched against the entire line. Although they were surrounded by the North Koreans, the 35th Infantry Regiment held its position. The 35th Infantry Regiment and its supporting units were awarded the Presidential Unit Citation for their efforts in preventing the North Korean divisions from breaking through to the port of Pusan. The 35th Infantry Regiment became known as The Rock of the Nam. As part of the United States IX Corps, the 35th Infantry Regiment was assigned to participate in Task Force Dolvin, an operation which was given the task of capturing the town of Chonju on the Kum River. By November 8th the 35th Infantry Regiment was positioned near the 38th parallel, which was the border between North and South Korea. They were attached to the United States IX Corps and assigned the mission of securing the Kaesong area. The 35th was joined by the Turkish Infantry Regiment and the Republic of Korea's 17th Regiment in combating vigorous and well organized attacks of armed enemy units in the Inchon and Pyongyang area. The IX Corps began an offensive against the North Koreans and Chinese to the north of Pyongyang on November 24th and moved to the Chongchon River area. The terrain was rough, frozen, and mountainous. On November 25th, the IX Corps was surprised by an onslaught of overwhelming numbers of Communist Chinese forces who descended upon them from Manchuria beyond the Yalu River. The 25th Infantry Division, the 2nd Infantry Division, and the Turkish Brigade were in the center of the line. The Chinese pushed the IX Corps back for about 50 miles where they dug in and waited for further Chinese attacks, which came on the evening of November 26th. The Chinese struck the IX Corps section of the line with five field armies. The Republic of Korea 1st Division was driven back, and the Chinese Communist Forces 39th and 40th Armies attacked the 35th Infantry Regiment during the night and withdrew from the battlefield at dawn. The battles of the Chongchon River valley were a major defeat for the IX Corps. During this time the 35th Infantry Regiment lost more men than at any other time in the Korean War. Teddy Ray Chandler was one of those soldiers. He was listed as missing in action on November 27, 1950. His body was never found, and he was presumed dead on December 31, 1953. The decorations earned by Teddy during his short military career were the Combat Infantryman Badge, the National Defense Service Medal, the Korean Service Medal, the United Nations Korea Service Medal, the Republic of Korea War Service Medal, and the Purple Heart. Teddy was preceded in death by his father Opha who died in 1949. At the time of his death, Teddy was survived by his mother Rose Mary who passed away in 1976; brothers Clarence, Joseph, Carl, and Bobby, and sisters Hazel Runyon and June Ann Means.